If you’re serving in Afghanistan or about to, you need this phrasebook. It may not help you to understand everything Afghans are saying, but it will enable you to ask questions, convey meanings and give orders that are essential to what you need to accomplish. And quite possibly some of those questions, meanings and orders could save your life and/or the lives of others. Aside from the serious stuff, there are also many social expressions that will please and impress Afghans with the fact that you know a little bit of their language, which most foreigners don’t. That’s a small, but significant step toward influencing the person in a positive way toward you and your country. Don’t be one of those arrogant guys who think that everyone in the world should speak your language. 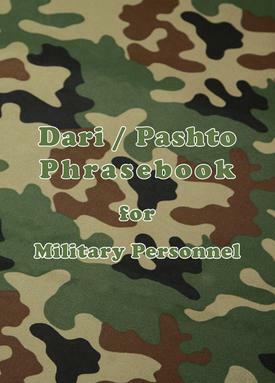 The phrasebook, which has 256 pages, gives you both the Dari and the Pashto equivalents of 3512 English phrases, 2083 terms, and 2031 individual words useful for operations, administration, logistics, training, security and everyday conversation. The Dari is in red and the Pashto in blue to make it easy to tell them apart. To help you with the pronunciation and grammar of Dari and Pashto, we’ve include appendices that explain them to you. There are also appendices on numbers, time expressions, and the metric system, plus a map of Afghanistan. Credit cards may be used.